The race track on Phillip Island, Australia is famous for a number of things, including the large number of birds that can be found on or near the race track. 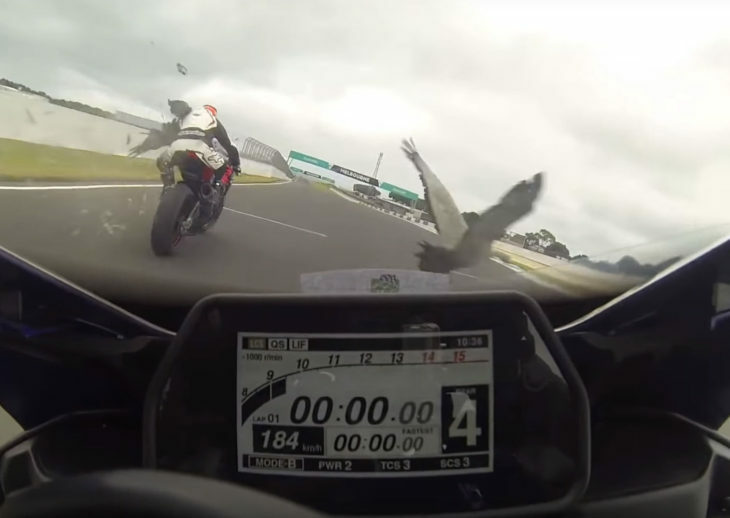 Famous encounters with birds have occurred in both WSB and MotoGP … sometimes impacting a rider or his bike. Now, we get a first hand look at what it is like to hit a bird on this circuit. I was riding at night in India. There were no road lamps. There was thud and my bike stopped in the middle of the road. There was something black stuck to my crushed head light. Didn’t know what it was until I heard mooo..
Hit a seagull with an ’82 RD350, on the way to get a safety done. Had sold the bike. Busted up the instrument cluster….damn. Put a Yamaha bikini fairing on the glued-up gauge pod. Got a deer with the RC51, got lucky there too. I once hit a turkey vulture, which are huge. The guy behind me said it looked like a feather explosion, fortunately I stayed up and motored on with a sore knee. Looks like the second rider, who at 181 km/h, was overtaking the rider that struck the goose, could not get out of the way of the first rider who was decelerating and going off the track. Things happen so fast at those speeds to have a good outcome at times. Interesting that the rider who did strike the goose, and had a rider strike him from behind, appears to have stayed vertical, and motored-off. I took out a bunny who thought he could out-run me on an off-ramp. Not like I swerved to miss or hit him.. All he had to do was avoid the large noisy object. NOT going 184kmph like these guys..
I’ve hit 1 bird and 2 deer without stopping. Luckily at relatively slow speed. I’ve been hit twice in the head by birds while riding, stayed up both times, full coverage helmet saved the day. this is similar to Vinales running into the back of Marquez. The accident is from the second rider running into the back of the first rider, a dangerous situation always, when you ride near others, on the track and off track. I hit a deer once, at the last second, he ran out and into me, a defense mechanism i guess, totaled my bike, no fun. Title of this should read “Two bikes collide”. Cant say if the first rider would have gone down, but he stayed up with the second rider hitting him from behind anyway. Racing is dangerous. RIP Marco Simoncelli. Artem: Ducati is far ahead, now.